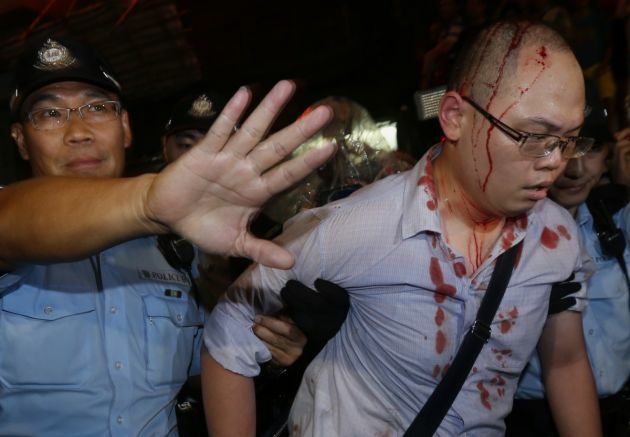 (Photo: REUTERS / Bobby Yip)A policeman with an injured pro-democracy protester after he was beaten by a group of anti-Occupy Central protesters at Hong Kong's Mongkok district October 3, 2014, where a main road is occupied. Violent scuffles broke out in one of Hong Kong's most famous and congested shopping districts on Friday, as hundreds of supporters of Chinese rule stormed tents and ripped down banners belonging to pro-democracy protesters, forcing many to retreat. Christians have taken part in Hong Kong's pro-democracy protests with prayer groups, crosses, and protesters reading Bibles in the street. Vatican Radio reports that Catholic, Methodist, and Anglican parishes are also opening their doors so demonstrators can have a place to eat, sleep, and pray. Other Christian groups organized prayer sessions while citing Christian values to inspire demonstrators. Pro-China groups accuse the protestors of disrupting the lives of the majority of Hong Kong residents, which the protestors say is not true. Thugs punched and kicked pro-democracy protesters Friday night, shedding blood as pulled down demonstrators' tents and attempted to forced them out, The Guardian reported. At least three of the founders of the main protest groups are Christians. This includes the 17-year-old leader Joshua Wong who is the public face of the rallies, the Wall Street Journal reported. Wong is now in college but he was a 15-year-old student at United Christian College (Kowloon East) when he led a movement called Scholarism. This group defeated the Hong Kong government's plan to introduce patriotic education classes in schools. Unlike the mainland China where religion is strictly controlled, churches in Hong Kong are very much embedded in its culture and "Christian institutions have since become part of Hong Kong's civil sensibility." Because of this, many see the protest as addressing the issue of democratic elections, but also the much older tension between Christianity and Communist China. The influence of Beijing through Chief Executive Leung Chun-ying "brings to Hong Kong the whole culture which is now reigning in China, a culture of falsity, of dishonesty, a lack of spiritual values," said Cardinal Joseph Zen, a former head of Hong Kong's Catholic flock. "We can see that it is coming, so we have to resist," he said. Joseph Cheng, a political science professor at City University of Hong Kong said that the gap between Christians and the Chinese government is "unbridgeable." He said that Christians don't trust the communists and the communists suppress the freedom of Christians. Government figures for 2013 show government there are about 480,000 Protestants and 363,000 Catholics living in Hong Kong, a city of about 7.2 million. Buddhists and Taoists make up the vast majority of the city, the government says.